WASHINGTON (CNN) -- The Obama administration took its first steps into the politically delicate world of church-state relations Thursday, issuing an executive order establishing a new review process to encourage nondiscriminatory hiring practices among religious groups accepting federal money. 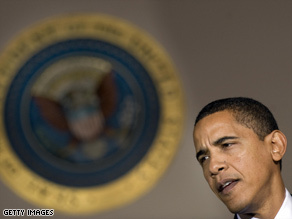 President Obama announced Thursday that he is changing the Office of Faith-Based Initiatives. The order is designed to strengthen the constitutional and legal grounding of former President Bush's controversial Office of Faith-Based Initiatives, two senior administration officials told CNN. "We think this is a key step forward. It doesn't resolve all issues at the outset, but it does provide a mechanism to address difficult legal issues moving forward," they said. Obama tapped Josh DuBois, who headed religious outreach for Obama's presidential campaign, to run the office. "This work is important, because whether it's a secular group advising families facing foreclosure or faith-based groups providing job-training to those who need work, few are closer to what's happening on our streets and in our neighborhoods than these organizations. People trust them. Communities rely on them. And we will help them." Critics of the office, which steers government money to religious charities that perform social services, say that under the Bush administration, faith groups were allowed to take religion and related issues into account when hiring. On contentious issues such as hiring, Obama found that one of the problems during the Bush years was that tough questions were decided without appropriate consideration, data and input from different sides, the officials said. There were ideological decisions instead of decisions based in fact, they said. Obama also created a new advisory council, whose 25 members will include Rabbi David Saperstein, head of the Religious Action Center of Reform Judaism; Judith Vredenburgh, the CEO of Big Brothers Big Sisters of America; Bishop Vashti McKenzie, the first female bishop of the African Methodist Episcopal Church; the Rev. Joel Hunter, the senior pastor of Northland Church, a megachurch in Orlando, Florida; and the Rev. Frank Page, a past president of the Southern Baptist Convention. The Office of Faith-Based and Neighborhood Partnerships is a programming and policy arm of the federal government. It is the primary mechanism for federal agencies to connect with local neighborhood and faith-based groups to deliver social services. Centers within executive agencies run programs such as job training for low-income individuals at the Department of Labor; ex-offender re-entry at the Department of Justice and international HIV/AIDS efforts at U.S. Agency for International Development. CNN's Suzanne Malveaux and Jessica Yellin contributed to this report.